Nesting dolls: a gift from my sissy! As you can tell Scout may be just a little nervous about his new role as big brother...or maybe just wasn't too thrilled about yet another photo shoot. SIDE NOTE: Some of you stinkers guessed it when I was filling you in on what was to come from Let's Just Build a House. So then i panicked a tiny bit and then I kind of--sort of lied to you in this post when I said I didn't mean to give out baby vibes! Ok, not really lied... I steered you off track and instead told you about a different life change we accomplished this year: becoming everything-but-the-house debt free. Which was big news itself. Anyway, this of course is a really super big life change too. 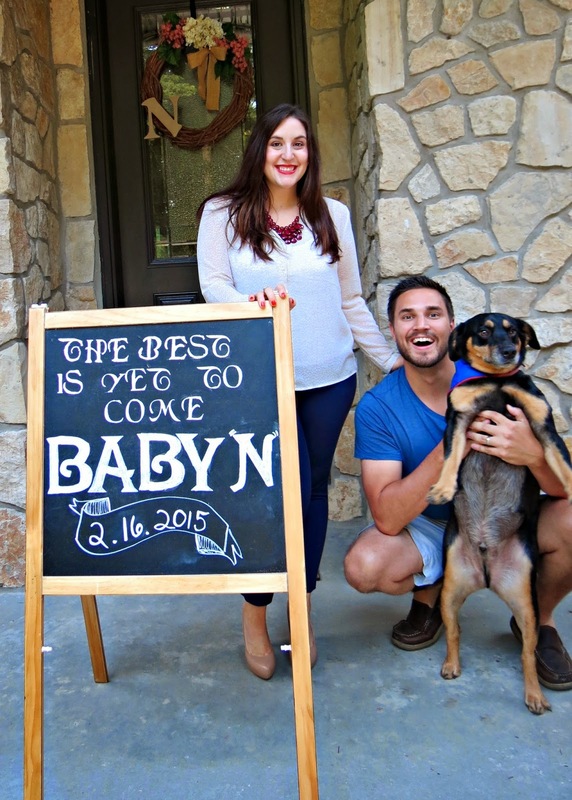 We are happy to finally share the news! More info on the new addition to our family, and house stuff to come! Stay tuned! whooooooooooooooooo hoooooooooooooo OMG OMG OMG!!! Congrats....OMG! YAY! Did I say "OMG"
Congrats to you too! Hope your first trimester has not been too rough! Congrats! Been reading your blog for some time as we are building our new home and moving in tomorrow. We're in Peoria and I grew up in Granville (next door to Spring Valley!) And, ironically, we're expecting our second child on 2-16-15!! Small world!! Mike congrats and small world! I know a few folks from Putnam County, I'm sure we have mutual friends! Same due date and everything how nuts! Thanks for readng and commenting. It's always nice to hear from someone in the Illinois Valley! nope I dare say it was pretty breezy no sickness, just TIRED! We'll see how this one goes! Thank YOU Kelly and congrats to you too on your little girl!! It sure it, thanks Jennifer! YAYYYYY!!! SO excited for you guys!!! CONGRATS! !